Orca Relief Citizens’ Alliance (“Orca Relief”) is a non-profit organization committed to conservation of killer whales (Orcinus orca), with a primary focus on the southern resident killer whale (SRKW) population stock in the Pacific Northwest. Center for Biological Diversity is a national, nonprofit conservation organization with more than 1.1 million members and online activists dedicated to the protection of endangered species and wild places. SeaWolf is an all-volunteer, NW marine wildlife advocacy and education organization, focusing mainly on the Southern Resident Killer Whale population and other coastal NW species. Pursuant to the Endangered Species Act (ESA), 16 U.S.C. § 1540(f); the Marine Mammal Protection Act (MMPA), 16 U.S.C. § 1382(a); and Section 553(e) of the Administrative Procedure Act (APA), 5 U.S.C. § 553(e), Orca Relief Citizens’ Alliance and others hereby petition the Secretary of Commerce, through the National Marine Fisheries Service (NMFS), to establish a whale protection zone (WPZ) with supporting regulations to facilitate recovery of the endangered southern resident killer whale (Orcinus orca; SRKW). The SRKW is listed as an endangered distinct population segment (DPS) under the ESA and a depleted population stock under the MMPA. In the course of such rulemaking, NMFS should determine the most appropriate geographic location, boundaries, and other supporting regulations to ensure recovery of the endangered SRKW DPS. Section 9 (a)(1) of the ESA makes it “unlawful for any person subject to the jurisdiction of the United States to take any such [endangered] species within the United States or the territorial sea of the United States” and Section 3(19) defines the term “take” to mean “to harass, harm, pursue . . . or to attempt to engage in any such conduct,” any or all of which may occur as commercial and private motorized vessels follow the SRKWs. The MMPA (section 2(2)) states: “In particular, efforts should be made to protect essential habitats, including the rookeries, mating grounds, and areas of similar significance for each species of marine mammal from the adverse effect of [human] actions.” The MMPA (section 112(e)) further states: “If the Secretary determines, based on a stock assessment under section 117 or other significant new information obtained under this Act, that impacts on rookeries, mating grounds, or other areas of similar ecological significance to marine mammals may be causing the decline or impeding the recovery of a strategic stock, the Secretary may develop and implement conservation or management measures to alleviate those impacts. Such measures shall be developed and implemented after consultation with the Marine Mammal Commission and the appropriate Federal agencies and after notice and opportunity for public comment.” The SRKW DPS is a strategic stock by virtue of the fact that it is listed as endangered under the ESA. The APA allows for an interested person to participate in the updating of regulations through the submission of a petition for the “issuance, amendment, or repeal of a rule” (5 U.S.C. § 553(e)). Failure to respond to such a petition within a reasonable timeframe constitutes a violation of an agency’s duty under the APA (5 U.S.C. § 555(e)). The petitioners consider 12 months to be such a reasonable timeframe and request that the agency respond to the petition within that period. 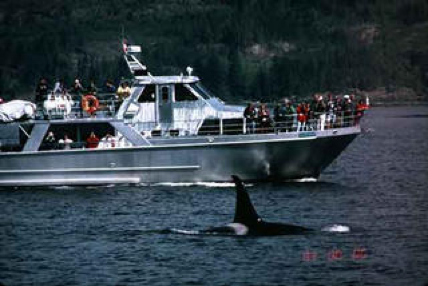 In this petition, Orca Relief and co-signers (hereafter referred to as the petitioners) demonstrate that the SRKW DPS is not recovering, that SRKWs are being “taken” regularly by noise and disturbance from commercial and non-commercial vessels ranging from tanker and cargo ships to commercial whale watch and recreational boaters, which collectively impact the SRKW communication and degrade their habitat with noise. Thus, both the whales and their habitat warrant further protection. NMFS has the authority to establish and implement protective measures that it is not using. To fulfill its responsibilities, the agency should rapidly implement any methods and procedures that would aid full recovery of the SRKW DPS, including a whale protection zone (WPZ). Although SRKW suffer from multiple threats, including lack of adequate food, pollution, and the risk of a catastrophic oil spill, a WPZ is a commonsense approach to noise impacts that can be implemented immediately. Confident that such a WPZ is necessary, the petitioners urge NMFS to act on this petition with all due haste. Recent trends indicate that recovery will be increasingly difficult in the absence of stronger habitat protection. Killer whales are an iconic species, particularly in the Pacific Northwest; and their presence in the Salish Sea is strongly reflected in Native culture and the staunch environmental ethic that is characteristic of the region. These iconic whales deserve protection from noise and disturbance and, given recent trends, their very existence appears to depend upon it. Providing that federal agencies must “give . . . interested person[s] the right to petition for the issuance, amendment, or repeal of a rule.” The APA requires agencies to respond to petitions for rulemaking “within a reasonable time.” 5 U.S.C. § 555(b). If the agency denies the petition, it must include “a brief statement of the grounds for denial.” 5 U.S.C. § 555(e). ESA 16 U.S.C. 1540 (f) authorizes NMFS “to promulgate such regulations as may be appropriate to enforce this chapter,” and section 1382(a) of the MMPA provides that “[t]he Secretary, in consultation with any other Federal agency to the extent that such agency may be affected, shall prescribe such regulations as are necessary and appropriate to carry out the purposes of this subchapter.” These are the two provisions that NMFS cited for its 2011 vessel regulations. NMFS 2016, p. 1 (see also NMFS Endangered and Threatened Listing Recovery Guidelines (55 FR 24296, June 15, 1990). NMFS 2016, p. 4 emphasis added.